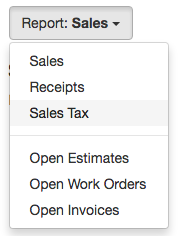 Accounting Reports allow you track sales and receipts from all of your jobs in real time. Select Reports from the top menu. Use the Search Bar and Tags to narrow your search.